SHOT mini-reviews » 2012 » I.O.R. Valdada 1-10x26mm Eliminator(s) Shot show 2012 mini reviews. I.O.R. Valdada 1-10x26mm Eliminator(s) Shot show 2012 mini reviews. For those of you who do not know. IOR is a European optics manufacturer founded in 1936 in Romania that went on to produce some of the advanced sniper scopes used by the U.S.S.R. during the cold war era. Of particular note was IOR’s version of the PSO-1 sniper scope. In 1990 IOR optics began to be imported into the U.S. by Valdada. IOR Valdada has shown remarkable speed and agility in designing and bringing new optics to market. 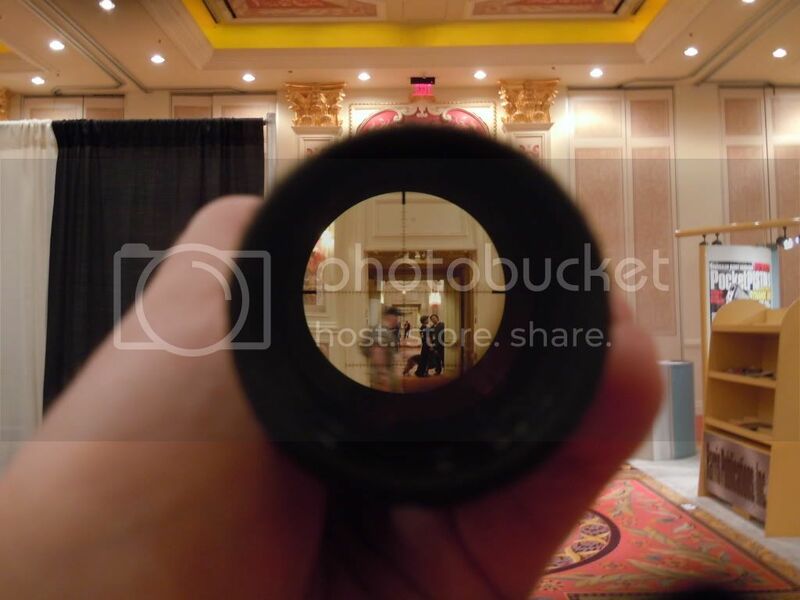 It is notable that in an era when many brands put forward optics that are designed and manufactured by third party’s and differ very little internally from optics marketed by other competing brands who use the same third party manufacturer, IOR designs and manufactures its own product. 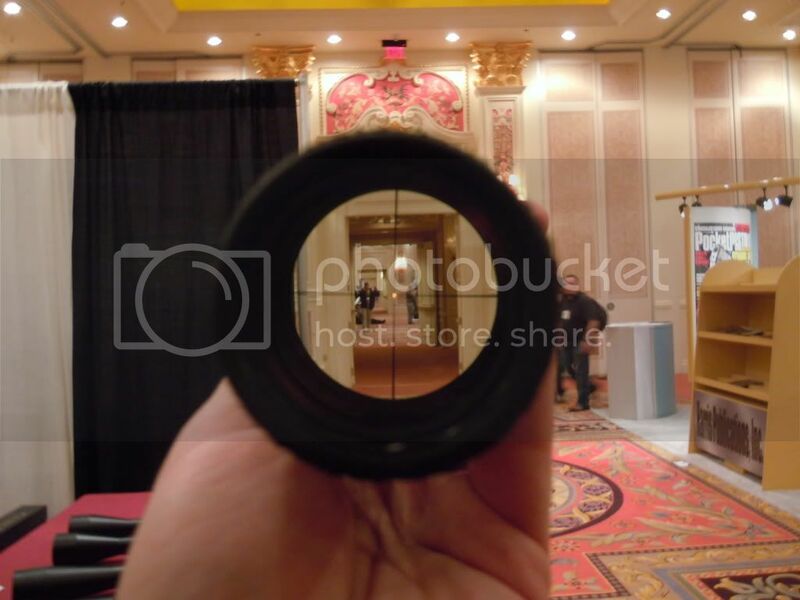 Of interest today will be the two new 1-10x power scopes introduced this year. These are the 1-10x26mm Eliminator and the 1-10x26mm Eliminator L.T.S. They sit at $2895 and $2375 respectively. I have here pictured from top to bottom: The IOR Valdada pitbull, The Eliminator, and the Eliminator L.T.S. You will note that my reference GRSC 1-6x present as a size and optical comparison in all other articles of this series is not shown in this picture. I was told by Val that I was not to picture that scope next to his and that I was not to use it as an optical comparison as he saw it as unfair to compare a 1-6x scope with 1-10x designs. 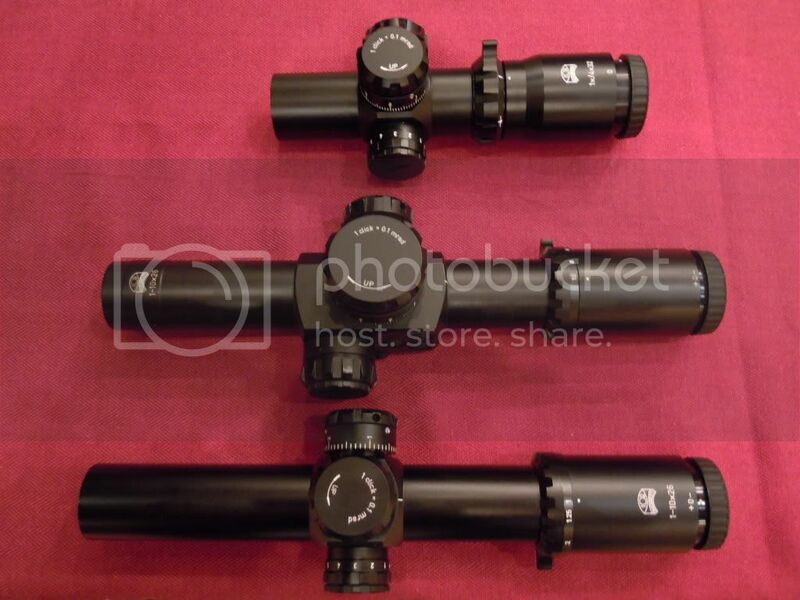 Similarly, Val told me that, should I do a full review of these scopes as I had planned, I would not be able to compare them to the Leupold, S&B, Premier, and possibly USO 1-8x designs as that would also be an unfair comparison due to the different power ranges. I have had no other scope manufacturer even attempt to make such demands on my reviews and I see little reason to spend my time and energy doing a full review of optics that I cannot compare to other optics which I think my reader might find of interest. This review is all you are going to get from me when it comes to reviews of the IOR 1-10x offerings. First I will talk about the $2895 Eliminator. To say that this scope is loaded with features is an understatement. To start things off it has a side focus parallax knob. This is the only scope in the 1-(n)x scope class to have an adjustable parallax. Immediately behind this control is a digital dual focal plane illumination control system. 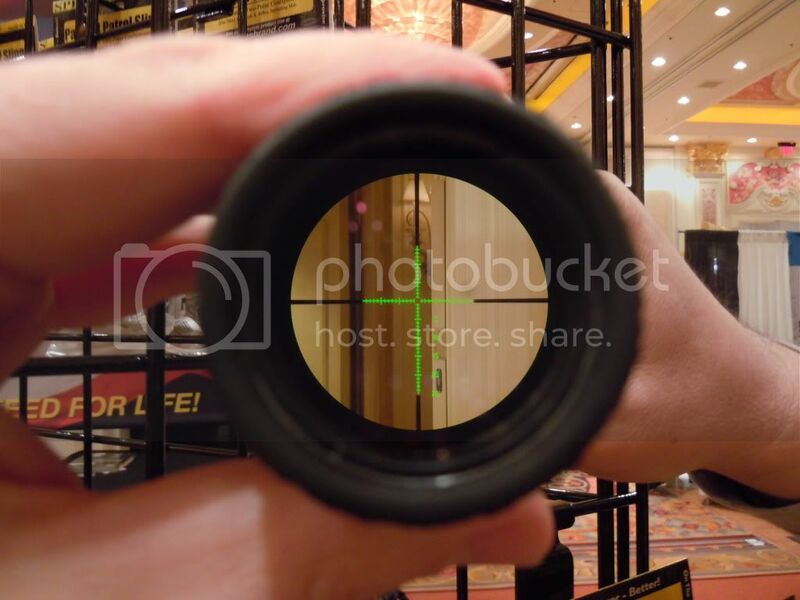 In the first focal plane was a green illuminated mil scale reticle in the sample at the booth. 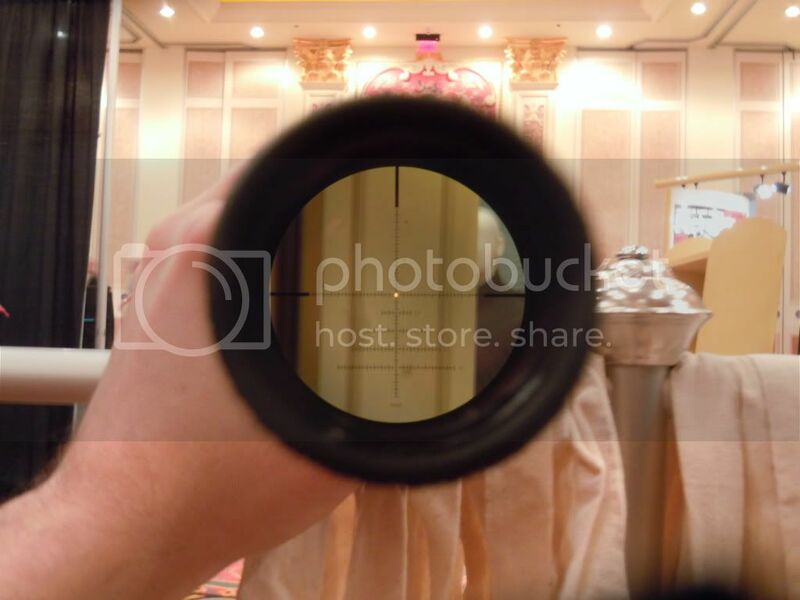 I was told though that this is not the normal reticle and that usually this scope will be equipped with the Christmas tree style mil scale reticle shown in the pics of the LTS scope. In the second focal plane is an amber illuminated flash dot. It is worth noting that this dot did not seem as bright that of other (apparently non-competing) scopes and a bit of stray illumination light was visible on the edges. Either plane illumination can be activated on its own or both at once. The knobs on the Eliminator are likewise quite loaded. The elevation knob is huge and has a zero stop as well as the ability for the user to set the knobs indicator to the users zero (both require use of a set screw.) Interestingly a second zero point indicator also exists on this knob that the user can simply turn into position. This might come in handy for an individual competing at two set ranges and this particular demo scope had been taken off of a competitive 3-gunners rig. Like the elevation, the windage can also be set to the users zero and has an optional zero stop. Both knobs are very large, offer plenty of adjustment range, have good feeling positive clicks, and are in .1mil increments to match the reticle. In many ways the Eliminator L.T.S. is similar to its more expensive brother. It appears to be built off of the same, or more likely very similar, optical design. and my subjective observations on it optically are the same. The differences between the two are that on the L.T.S. parallax is fixed, the reticle is second focal plane only, illumination is analog, and the windage and elevation knobs are both of the type used for the Eliminator’s windage. A notable consequence of these changes is that the illumination on the L.T.S. only lights a dot in the middle of the reticle. Normally this illumination scheme can be problematic because it hinders a scopes ability to range in low light, but when dealing with a 2nd focal plane 10x scope with only a 26mm objective you are not going to be doing any ranging in low light anyway. There will not be enough light to see anything. This can be ameliorated with the first focal plane scope because turning down the power will help with your light problem and you can still range but on the 2nd focal plane, if you turn down the power your reticle is no longer the right size relative to the target and so you are consequently not able to range for a different reason. The bottom line is that if you want to range in low light you need the full rock and roll Eliminator and not the L.T.S. Here are the pics through the L.T.S. keep in mind that this Christmas tree reticle is also the normal reticle option in the Eliminatior.